Stanford allotted an $850,000 increase in funding for the Creative Writing Program this academic year in response to a rise in course enrollments, according to the 2013-14 University budget. The money will expand the program’s enrollment capacity by funding additional lectures and classes. “We are living in an age of participatory humanities,” said Eavan Boland, director of the Creative Writing Program, a subsidiary of the English Department. Despite the long maintenance of a strong graduate program in creative writing, Boland said the English Department “hadn’t really figured out its relation to the undergraduate community” until around 15 years ago. 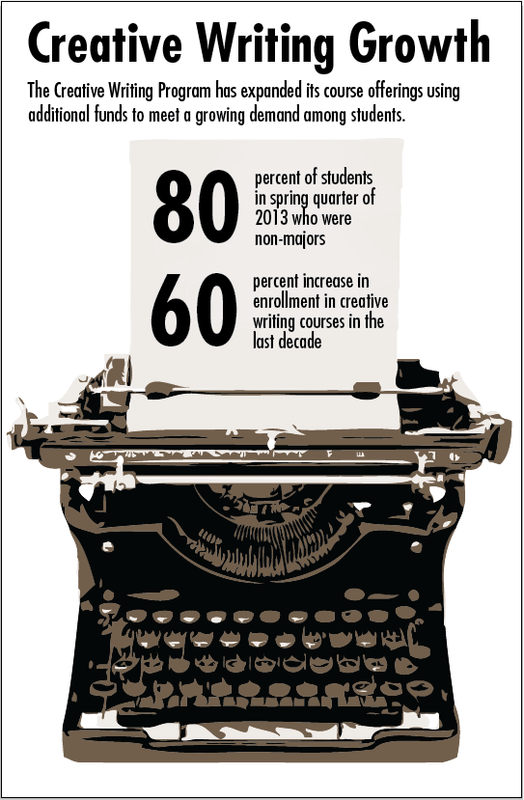 Since then, enrollment in creative writing courses has increased dramatically—almost 60 percent in the past decade, from 479 undergraduates in 2002-03 to 802 last year. In response to the increasing student demand, the program has also expanded its course offerings. There are almost four times as many creative writing courses this year (23 courses) than there were in the 2002-03 academic year (six courses) and more than twice as many sections (74 to 34 sections). The boom in popularity began with the introduction of the creative writing minor, a six-course minor with concentrations in poetry and prose, about a decade ago. Today, the minor is one of the most popular minors at Stanford, according to Boland. Boland said that the primary reason why the Creative Writing Program is so popular is that it engages students in departments other than English. One creative writing class last quarter, for example, was composed entirely of math majors. 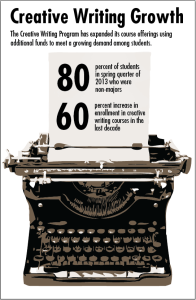 According to Boland, 80 percent of students in creative writing courses were non-majors in Spring 2013, although the numbers fluctuate each term. “The more my lecturers are dealing with CS and math and HumBio, the more they’re able to provide a very strong welcome for these students,” Boland said. She said that the minor “opened” the department for students not majoring in English. “We set [the minor] up 10 years ago precisely because we felt that gifted HumBio students [and] computer science students wanted to have this other involvement, and we wanted them to have it,” Boland said. Vivian Shen ‘14, a computer science major and a creative writing minor said she took creative writing classes for a change of pace and, since then, has found her experience to be useful. “The program is really well taught and seminars are different from lecture-based classes that Stanford offers nowadays, with one-on-one time with the teacher and feedback from classmates. Everyone can use something like that whether you’re techie or non techie,” Shen said. Shortly after the University began offering the minor, the Mohr and Stein families endowed the Mohr and Stein Visiting Writers Program, allowing the University to welcome two distinguished writers—one in poetry and one in fiction—to teach a small seminar to undergraduates. “The lecturers, who I couldn’t speak highly enough of, really are the engine of innovation and interest with the undergraduates,” Boland said. Despite its widespread popularity, the Creative Writing Program houses six professors compared to the more than 30 professors in the literature office of the English Department. Rather than relying on professors to teach undergraduates, instruction in the Creative Writing Program is led almost exclusively by lecturers, visiting writers and Stegner Fellows. Started in 2002, the Levinthal Tutorial, a quarter-long mentorship program that connects undergraduate writers with Stegner Fellows, has also been growing in popularity and receives more and more applications each year. Boland said they added a creative non-fiction option to the tutorial as student interest in the genre grew. The Creative Writing Program has striven to innovate with shifting trends in creative expression. Boland said that the program, with an anti-hierarchical structure, encourages lecturers to propose and implement new ideas for engaging students. Boland said that creative writing lecturers have increasingly offered classes which engage new media, including “Fiction into Film,” “The Graphic Novel” and “Literary Media: From Frankenstein to Facebook.” Additionally, events with inventive structures, like the Four Minute Reading series initiated by lecturer Tom Kealey about seven years ago, attract student involvement. “It is totally our commitment and policy to encourage that innovation because that’s at the heart of really what the humanities is involved in,” Boland said. Although this year’s creative writing enrollment is slightly down from the fall and winter of 2012 (431 versus 483 students enrolled), Boland anticipates that the program will continue to grow over the next five years. To keep class sizes below 15 students, the Creative Writing Program has always mediated its enrollment. The dramatic rise in student interest has therefore prevented some from enrolling in sections of their choice. Although Program Administrator Christina Ablaza estimated that fewer than 10 students each quarter are unable to place into a section, Boland said that even short waitlists bother her. “We want to spend the money on student enhancement,” Boland said. She described that the additional funding from the University would be used to finance more classes, sections and events for undergraduates. Boland also expressed enthusiasm for forming new interdisciplinary partnerships with other Stanford departments. She said that the Faculty Senate is currently reviewing a proposal for an interdisciplinary computer science and creative writing major. Contact Julia Enthoven at jjejje ‘at’ stanford.edu.